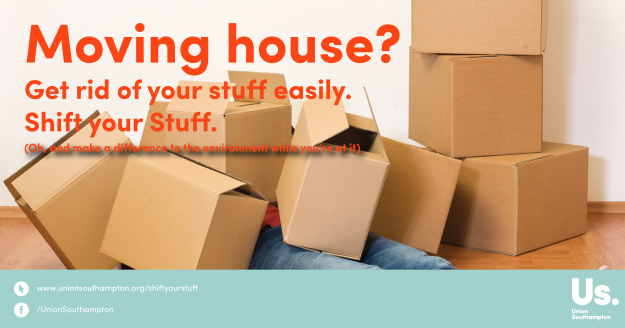 Shift Your Stuff is back for a third year, helping you to give your unwanted items a new home when you move out of your house this summer. We want to help you donate these items to a good cause, reducing the waste that goes to landfill in the process. It’s really simple. Available from 31 May until 29 June from the Union’s Highfield reception, Avenue Campus reception and the WSA Café. Sort your items into the categories on the stickers and put into separate bags labelled with the stickers provided. Please make sure your items are in a good, clean condition. If you have heavier items such as books or kitchen utensils and crockery please consider using boxes where possible to make the bags easier to manage and to prevent them from splitting. We can’t accept sharp knives, liquids or perishable foods, electronics and bulky items. If you do have bulky items Southampton City Council offers a bulky waste collection service for a fee. Step Three: Shift your stuff! If you live in the collection area below, leave your bag outside your house to be picked up from your doorstep. Collections will be on Tuesday 13 June and Friday 30 June. You can put your bags out late the night before on the day of collection but please aim to put them out by midday on the collection days. Bags must be visible from the road and have the appropriate stickers on them. You can also bring your stuff down to the red bins at the Union reception (B42) from Thursday 01 June. All of these items will also go to local charity rather than waste. We’re looking for volunteers to help collect and sort the donations. Interested? To sign up, click here.